To Cite: Keyvani H, Ahmadi N A, Ranjbar M M, Ataei Kachooei S, Ghorban K, et al. Immunoinformatics Study of gp120 of Human Immunodeficiency Virus Type 1 Subtype CRF35_AD Isolated from Iranian Patients, Arch Clin Infect Dis. 2016 ; 11(4):e36270. doi: 10.5812/archcid.36270. Background: Human Immunodeficiency Virus (HIV)-1 infection is one of the most important infectious diseases in Iran, and common isolates belong to the new CRF35_AD subtypes. The Gp120 protein, which is located on the surface of the HIV envelope, plays a role in entrance into host cells and immune responses. As there isn’t any clear analysis of the envelope protein of Iranian isolates regarding potential variations, structural and immunological properties, in the current study we attempted to research in this area. Objectives: The present study was designed to demonstrate the immunoinformatics of gp120 of human immunodeficiency virus Type 1 subtype CRF35_AD, isolated from Iranian patients. Methods: In this analytical perspective bioinformatics study, the steps were as follows; data collection and sequence classification (303 sequences), finding the mutational/conserved regions, evaluation of N-linked glycosylation sites, prediction of tertiary structures, model validation, and prediction of conformational and linear B-cell epitopes. Results: High degrees of sequence variation in the CRF35_AD subtype and also more than 10 variation sites in gp120 protein segments were identified. The total N-linked glycosylation sites for selected complete env sequences in NX [ST] pattern and the NXS and NXT combination count revealed that most of the glycosylation sites were conserved. Tertiary structure was obtained by homology modeling, and the Ramachandran plot assessment showed model validity. Finally, mapped consensus discontinuous immunogenic regions (epitopes) were AA25-65, AA337-365 and AA443-505. Conclusions: The obtained results provide a background for understanding CRF35_AD molecular characteristics, as well as design and development of effective HIV-1 vaccines and immunotherapeutic regimens against CRF35_AD subtype. Human immunodeficiency virus (HIV) is a member of the genus lentivirus and the family retroviridae, which causes acquired immunodeficiency syndrome (AIDS). This is a condition in which progressive failure of the immune system allows life-threatening opportunistic infections and cancers to thrive (1, 2). In Iran, the first case of HIV was detected in 1996, and the prevalence of HIV among the general population in Iran has remained low until now, but it has a high prevalence among injection drug users (IDUs). Measures adopted over the years resulted in slowed progression of the epidemic amongst IDUs, but the role of sexual transmission in the spread of HIV in Iran is alarmingly growing (3-5). Therefore, the HIV epidemic in Iran is in the concentrated phase (6). The primary envelope (env) gene product is a single polypeptide precursor named gp160, which is then cleaved into gp120 (~ 480 amino acids) and gp41 (~ 345 amino acids) in the endoplasmic reticulum by the cellular protease (7). The gp120 is an extracellular protein located on the surface of HIV envelope, while gp41 acts as an integral transmembrane protein. The entrance of HIV into cells is dependent on gp120, as it acts in attachment to specific cell surface receptors such as CD4 receptor and chemokine receptors (8, 9). Glycosylations of gp120 plays a vital role in mediating interactions of the virus with innate and adaptive components of the immune system (10). Although there is little evidence on variations and immunoinformatics characteristics of CRF35_AD subtype, there are noticeable data available for other subtypes. Envelope region of different HIV-1 isolates showed high variability (approximately 30%), and were mainly located in five hypervariable regions (HVRs), V1 to V5. These variations are related to the infidelity of reverse transcriptase enzyme that has no editing process for transcriptional errors (11). Also, investigations on antibody mapping showed that the linear epitopes on the gp120) glycoprotein (located in the V2 and V3 regions, constitute the most highly exposed peptides on the HIV multimeric envelope glycoprotein complex (12). Antibodies against the V3 loop of gp120 neutralize HIV infection, however, these antibodies are mostly type-specific, and do not possess the potential of broad neutralization (12). Variation events in the V2 and V3 regions of the envelope glycoprotein increase the ability of the viral strains to infect different cell types (13). Besides, accumulation of variations results in changes in biological properties of viruses and these variations significantly affect pathogenesis of the disease (14, 15). The function of a protein is dependent on its tertiary (3D) structure, and in vitro methods for identification of protein’s 3D structure by X-ray crystallography are time-consuming and very expensive in comparison with in silico prediction methods (16, 17). Moreover, clarification of 3D structure helps immunoinformatics and chemoinformatics, required for designing novel vaccine and inhibitory medicines (18). Since there are not much data available on variability and immunoinformatics characteristics of Iranian isolates of HIV-1 (CRF35_AD subtype), the present study can be valuable in providing background data required for development of preventive vaccines and therapeutic regimens. The present study concentrated on finding mutational/conserved regions, generation of 3D structure of the gp120 protein by homology modeling, then validation of this model, and finally analysis of in silico immunological properties of gp120 protein in Iranian isolates, CRF35_AD subtype. In this analytical perspective bioinformatics study, the complete coding region of putative env protein sequences and partial gp120 protein sequences of 303 CRF35_AD isolates, which were assumed to be Iranian HIV-1 subtypes, were retrieved from the National center for biotechnology information (NCBI) database (http://ncbi.nlm.nih.gov/), and datasets were built. The retrieved sequences were aligned using the ClustalW algorithm (19), and analyzed and trimmed in the Bioedite 7.7.9 software. Subsequently, short sequences and gaps were excluded from datasets. The Shannon entropy analysis (20), the Simpson index (21) and the Wu-Kabat variability coefficient (22, 23) approaches were exploited for evaluation of variability, and finding mutational/conservative regions, among sequences. The Shannon entropy analysis (20) is the most sensitive method for evaluation of variations. The Simpson index is another variation analysis method for calculation of diversities. The Wu-Kabat variability coefficient is a well-established descriptor of susceptibility of an amino acid position to evolutionary replacements (23). For predicting N-linked glycosylation sites, which is one of the Post-Translational Modifications (PTMs), we took advantage of the GlycoSite tool at Los Alamos HIV database (24). This tool highlights and tallies predicted Nx [ST] patterns, where x can be any amino acid. In glycosylation processes, an oligosaccharide chain binds to asparagine (N) occurring in the tri-peptide sequence N-X-S or N-X-T, where X can be any amino acid except Pro (24). Accession numbers of the used sequences were BAM37429, BAM37384, BAM37456 and BAM37411, named A, B, C and D, respectively (6). Of course, we randomly selected these four sequences. The BLASTP (protein basic local alignment search tool) and PSIBLAST in protein data bank (PDB) were applied for selection of the most homologous sequences to target sequences as template, and for constructing 3D model of gp120 protein of CRF 35_AD (accession number BAM37429) by the homology modeling method. The mentioned parameters for selecting template were resolution below 3 angstrom related to its x-ray crystallography, R value below 0.3, similarity of template with targeted sequence above 70% and also low E value and root-mean-square deviation (RMSD). For gaining target-template alignment, ClustalW, using a gap penalty of 10 and a gap extension penalty of 0.05, was employed. Target-template alignment and loop modeling were used for subsequent model generation by the MODELLER software version 9v7. Then the 3D model energy minimized in the Swiss-Pdb Viewer software v4.1. Evaluation of model validity quality is an essential step in homology modeling. A geometric evaluation of the modeled 3D structure was performed using the Ramachandran plot (25). We took advantage of DiscoTope 2.0, ElliPro and CBTOPE servers for conformational predictions, also called discontinuous, B cell epitopes from protein 3D structures. Kolaskar and Tongaonkar prediction method is a physico-chemical approach for B-cell epitope prediction based on a semi-empirical method, developed on physico-chemical properties of amino acid residues. This approach has enough efficiency to detect antigenic peptides with about 75% accuracy (26). In the present study, according to the server suggestions, positions with H > 2.0 in Shannon entropy plot, D > 0.6 in Simpson plot and variability > 15 in Wu-Kabat are considered variable, whereas those below this threshold were supposed to be semi-conserved or conserved regions. The entropy of the env of the Iranian HIV-1 isolates showed different regions in protein sequences (showed by arrows in Figure 1, stretch between amino acid 80 - 97, 130 - 200, 310, 332 - 353, 375 - 378, 410 - 425, 474 - 488, 640 - 645 and 662 - 674) with high entropy (or hypervariable regions, HVRs), and in gp120 separately (Figure 2, amino acid positions 48, 64, 77, 93, 96, 99, 103, 111, 117 and 123). Wu-Kabat showed low sensitivity and four HVR regions in env and five in gp120. Results of Shannon and Simpson variation plots were very similar to each other. Values were computed from the alignments of env sequences. This plot shows variations along protein sequences. The x-axis represents protein sequence positions, and the y-axis depicts the Shannon computed results. Values were computed from the alignments of env sequences. This plots shows variations along protein sequences of Iranian isolates of HIV-1. The x-axis shows the protein sequence positions, and the y-axis represents the Shannon computed results. The vast majority of positions in gp41 segment (Figure 1), exhibited low to moderate entropy (≤ 2.0) (except two highly variable regions), indicating lower probability of mutations occurring over time in comparison with gp120 (13 highly variable regions) of CRF35_AD subtype. As it is clearly demonstrated in Figure 3, in case of CRF 35 AD, based on all sequences registered in NCBI Los Alamos until now, in Iranian isolates of HIV-1 that belong to different subtypes, there are 10 or more sites of variability, most of which are located in COOH termini and loop of gp120 protein. These highly variable regions are demonstrated in 3D structure of env protein of CRF35_AD subtype that was constructed by homology modeling in this study (Figure 3). Overall, entropy analysis revealed numerous highly variable regions and very low conserved regions, especially in gp120 segment. The total potential in N-linked glycosylation sites (PNGSs) in NX [ST] pattern for A, B, C and D isolates was 30, 29, 33, and 28, respectively. Also, the NXS and NXT combination count for AC; BAM37429, BAM37384, BAM37456 and BAM37411 were 11 and 19, 12 and 17, 7 and 26, and 13 and 15, respectively (see details in Figure 4). According to the results, most of the glycosylation sites are conserved, although there are differences in number of glycosylations between isolates that will effect potency of virus in infecting Iranian hosts. Glycosylation is more frequent in gp12 segment, in amino acids ~ 130 to 400. 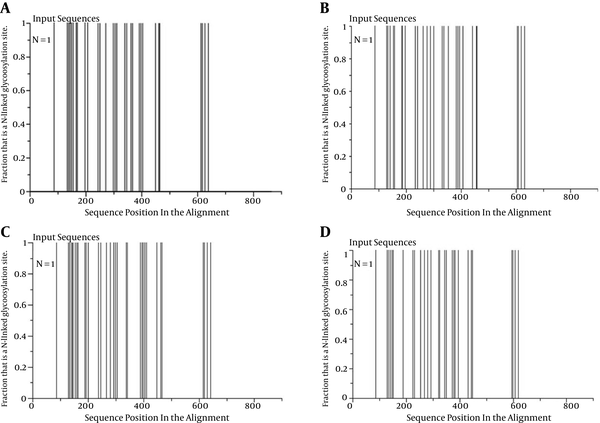 X-axis, position of N- glycosylation in envelope protein; Y-axis, fraction that is an N-linked glycosylation site; A, BAM37429; B, BAM37384; C, BAM37456; D, BAM37411. By homology modeling followed with energy minimization, 3D structures of gp120 protein of CRF35_AD subtype were predicted based on 4TVP template. The gp120 3D model with a total number of 522 residues was validated using the Ramachandran plot. Assessment of the plot showed that 84.9% of residues (443 amino acids) were in the most favored regions, 8.8% (46 amino acids) in allowed regions, and 6.3% (33 amino acids) in the outlier region. The overall percentage of residues in favored and allowed regions was 93.7. The results obtained for quality of predicted model are acceptable because most of the assessed residues are located in the favored and allowed regions of the Ramachandran plot. Identified conformational and linear B-cell epitope out of 524 total residues for gp120, subtype CRF35_AD, by hybrid approach, is presented in Table 1 represents in 3D structure (Figure 5). 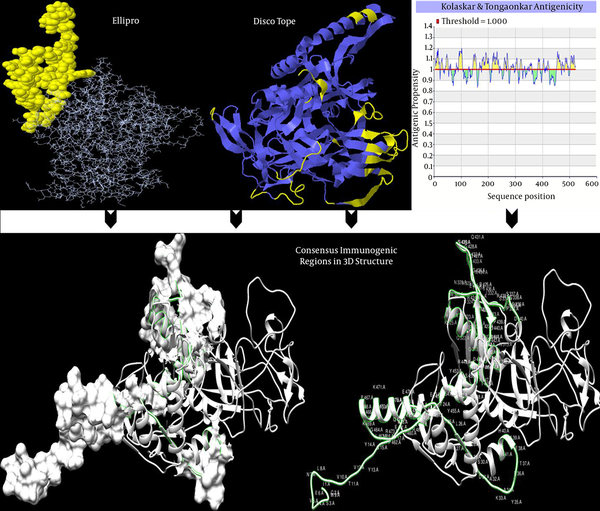 Also, results of Dicotope and ElliPro servers, and mapping consensus immunogenic epitopes were visualized and represented in 3D modeled structures (Figure 5). aEpitopes arranged based on their scores. Upper photos show predicted dominant epitopes by DiscoTope, ElliPro and Kolaskar and Tongoankar antigenicity methods. Also, below the figure, consensus immunogenic region among servers are represented. Immunogenic epitopes are represented in Ribbon (Discotope) and line and spheres (ElliPro) by software default in upper Figure 5. As there are arranged epitopes in Table 1, some predicted epitopic regions by DiscoTope and Ellipro software, and also in linear epitope prediction results, are overlapping (or consensus). 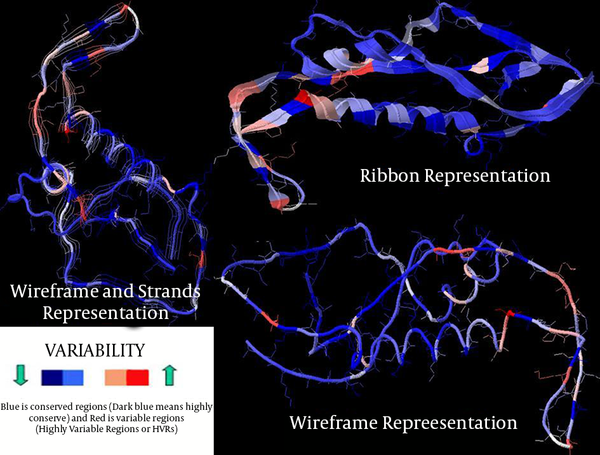 In lower figures by two representations (ribbon & ribbon and surface representation), consensus immune region based on the results of conformational (DiscoTope and ellipro) and Linear (Kolaskar and Tongaonkar) is depicted. Based on conformational and linear results of servers, transmembrane topology and N-Linked glycosylation sites comparisons, finally three more consesus immunogenic regions by several predictors in Iranian gp120 protein were selected. AA25-65 (NH3-ICSAVENLWVTVYYGVPVW RDAETTLFCASDAKAYETEAH-COOH), AA337-365 (NH3-WNNTLGQVAAQLRKHWNKT IIFSNPSGGD-COOH) and AA443-505 (NH3-TGLLLTRDGGGGNQ SQNETFRPGGGDMRD NWRSELYKYKVVKIEPLGVA PTKAKRRVVQREKRAV-COOH). Also they were represented in Figure 5. There is no longer doubt that HIV-1 infection is the most important infectious disease in developing countries including Iran. There are a lot of concerns about the HIV/AIDS situation and route of transmission of the infection in Iran. The main concern is the potential of transmission between drug users through contaminated injection. Recently, the transmission pattern has shifted towards the sexual transmission, showing an increase of doubling, according to Iranian CDC (27, 28). To the best of our knowledge, there is no other published immunoinformatics and variation analysis on gp120 protein of CRF35_AD subtype, the dominant Iranian isolate analyzed in the present study. Therefore, this study aimed to address the variations in Iranian isolates. The envelope protein of the CRF35_AD subtype, the main Iranian HIV-1 isolate, contained 17 HVRs and gp120, separately 10 regions in all reported sequences, which reflects the relatively high degree of sequence variations among the studied isolates. Since gp120 segment has a pivotal role in the ability of HIV-1 to enter CD4+ T cells, it is quite sensible for the immune system neutralizing antibodies to bind to the sites located in variable regions of this protein. Consequently, the rate of mutations in the HVRs of gp120 are high, to provide the virus the chance of escaping from antiviral antibodies (29). Increasing gp120 variability helps viral replication, therefore causes viral fitness in individuals infected by diverse HIV-1 variants (30). Yao and colleagues analyzed five HVR regions from HIV-1 subtypes A, B, C, D, G, and H. The results revealed high gp120 variation, and the majority of HIV-1 gp120s had 496 - 515 amino acids (length polymorphism) and 21 - 30 PNGSs. Also, among five HVR regions, the V3 had the lowest rate of polymorphism and heterogeneity and more PNGSs, while V1 and V4 regions showed high rates of polymorphism, heterogeneity and more PNGSs (31). This assumption of structure is suggestive of the need of strategies for reducing the polymorphism, heterogeneity, and PNGSs in the four HVRs to be considered in HIV-1 vaccine development strategies for effectively stimulating immune response (31). Also, in evaluation of sequence diversity in HVRs of the external glycoprotein of HIV-1, extensive variation was found between sequences from different individuals, and various amino acid substitutions in the HVRs, which changed the number and positions of potential PNGSs (32). Understanding adaptive evolution of HIV in populations is essential in monitoring the spread of infection and developing effective vaccines (33). Rapid mutations of HIV-1 allow the virus to evade the adaptive host defense responses. Also, each HIV-1 subtype has variability in its env and other proteins, which could have different immune responses not cross-reactive with other subtypes (34). Another cause of increasing fitness of HIV to its individual (after mutation) is variability potential in N-linked glycosylation sites (PNGSs) (35). The total PNGSs in NX [ST] pattern was between 28 and 33, and for four isolates in combination of NXS and NXT, total PNGSs was 7 to 13 and 15 to 26, respectively, which revealed high glycosylation, conservation and potency of virus in infecting the host. The complete protein sequences in CRF35_AD of HIV-1 isolated from Iranian patients had 28 to 33 sites of glycosylation. The PNGSs prepares binding of long-chain carbohydrates to high variability regions of gp120, without blocking vital sites for binding to cellular receptors, thus it seems that the number of PNGSs in env might affect fitness of the virus by increasing or decreasing sensitivity to neutralizing antibodies via a protective coat of oligosaccharides that inhibits antibody binding to gp120 (28, 29). These large carbohydrate chains bound to gp120 might hide antibody-binding sites (29). If the PNGS number decreases significantly, the virus is in easy access of neutralizing antibodies. Also, higher glycan density promotes viral ability to evade antibodies, and thus promotes higher viral fitness (35, 36). Most studies have focused on the V3 loop (29, 35, 36), which is an important yet not exclusive determinant of viral tropism and cell entry. By utilizing the hybrid approach, evaluation of trans-membrane topology and N-Linked glycosylation sites, the comparison of three consesus immunogenic regions for Iraninan gp120 protein (CRF35_AD) was achieved. The regions included; AA25-65 (NH3- ICSAVENLWVTVYYGVPVWRDAETTLFCASDAKAYETEAH-COOH), AA337-365 (NH3-WNNTLGQVAAQLRKHWNKT IIFSNPSGGD-COOH) and AA443-505 (NH3TGLLLTRDGGGGNQS QNETFRPGGGDMRDNWRSELYKYKVVKIEPLGV APTKAKRRVVQREKRAV-COOH). Finding of HIV-1 immunogens, capable of inducing high-titer antibodies that neutralize a broad spectrum of HIV-1, has a major priority for HIV-1 vaccine development (37, 38). As previous studies have clearly indicated for other subtypes, Gp120 has five conserved (C1 ± C5) and HVRs (V1 ± V5) (39). Evaluation of antigenic conservation of epitopes of isolates from clades A, B, D, F, G and H showed that only the V3 and C5 structures are shared and well exposed to the immune system (39). These regions are also reported in CRF35_AD and obtained consensus epitopes are suitable for using in chimeric and polytopic vaccines and additionally production of immunotherapeutic antibodies (elicit antibodies capable of neutralizing virus infectivity). Clarification of the structure-function correlation in viral proteins is important for identification of potential vaccine targets to be exploited as preventive and therapeutic regimes (38). The predictions of features, such as trans-membrane domains, glycosylation sites, secondary and tertiary structure, are crucial for analyzing the structure-function relationship of proteins encoded in viral genomes (38). Ideally, results of the current study are useful for understanding CRF35_AD molecular characteristics (such as HVRs), levels and sites of glycosylation and its structure, as well as development of specific and effective envelope-based vaccines by identified consensus immunogenic candidate regions. The data of the present study can be analyzed along with data obtained from more isolates from Iran and also from other countries. This can be assumed as a disadvantage of the present study and should be followed as a broader study in the future. The authors thank all their colleagues, who cooperated in this investigation. Also, the authors specially thank Jahanbakhsh, since he, for first time, introduced the full genome sequences of Iranian HIV subtypes for future researches. Authors’ Contribution: All authors had equal contributions in this study (regarding: research, analysis, bioinformatics, interpretation and writing of the article). 28. American Iranian Council: Drug Use and HIV/AIDS in Iran.